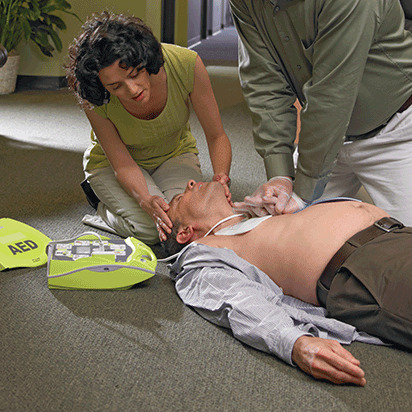 At the American Red Cross, we understand how important AED training is. That's why we deliver AED classes in Austin in several ways, including in-person, online, and via our blended Simulation Learning experience, which combines online coursework with in-person skills sessions. Regardless of how you train, once your course is complete, you'll be able to provide someone with the life-saving care they need, when they need it most. At the American Red Cross, AED classes in Austin can give you the knowledge and confidence to help someone in a time of crisis. Delivered in a traditional classroom setting, with lecture and hands-on skills training, our AED courses allow you to become familiar with the technology, ask questions, and learn in a supportive environment. AED training in Austin is available in person, online, and via our innovative blended Simulation Learning experience. By combining online coursework with in-person skills sessions, our Simulation Learning option allows you to learn at your own pace, then show your skills to a local Red Cross instructor. Once you've successfully completed both portions of the class, you'll receive full certification, which is valid for two years. In order to give you the information you need to provide care to someone in need, our Austin AED classes also include instruction on, and certification in, First Aid and CPR. And although these classes offer a wide range of information, they take just a few short hours to complete. In addition, our in-person and Simulation Learning courses on AED, First Aid and CPR are OSHA compliant and result in full certification, which is valid for two years. At the Red Cross, we offer AED training in Austin for students and administrators. Through our special schools program, your faculty and students can learn how to properly use an AED, and be ready to help when every moment counts. School courses result in full two-year certification, and all participants will have access to our online refresher materials, which can help keep their skills sharp long after their AED training has ended. The Red Cross not only offers Austin AED classes for individuals, but we also deliver industry-leading AED training for those who work in healthcare. Whether you're a first-responder, CNA, nurse or doctor, our training opportunities allow you to learn the latest information and proven techniques. The skills necessary for saving a life can easily be forgotten if you don't use them regularly. That's why, after completing our AED classes in Austin, you'll receive free online access to a range of refresher materials. With interactive quizzes, games and videos that you can use at any time during your two-year certification period, our refresher materials make it easy to keep your skills sharp and ready for anything. For more than 100 years, the American Red Cross has trained individuals, organizations, first responders, and medical professionals on the best practices for delivering excellent care. And our Austin AED certification courses are part of that legacy. Developed under the guidance of, and reviewed by, the Red Cross Scientific Advisory Council, our AED courses provide you with the latest science and proven techniques so that you can help when it's needed most.